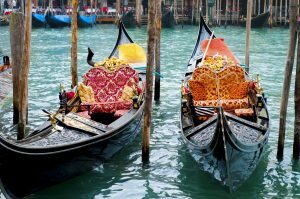 Venetian Gondola: history and curious facts about the symbol of Venice. 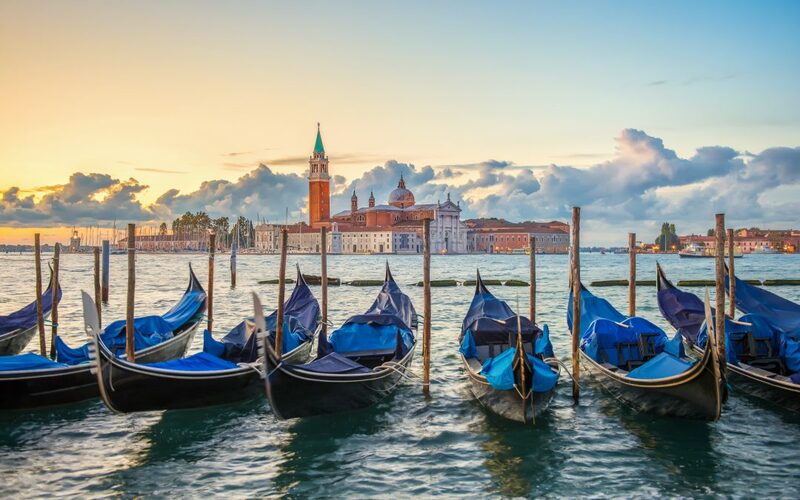 Venice is made to be admired by water and what better way than to navigate the canals and explore every corner in the most famous boat in the city, the legendary Venetian Gondola? The history of the Venetian Gondola is rooted in the dawn of centuries past. Its name, of uncertain etymology, would seem to derive from the Greek kundura, a rope boat, or from the Latin cunula, cradle, and from the beginning it was intended to transport the aristocratic classes. Despite its length of 11 meters, 36 feet, the gondoliers define it as a “manoeuvrable” boat because thanks to its tapered shape and flat bottom, which is useful when crossing even the shallowest waters, the Gondola is easily governed by the expert hands of its guides, and a Venetian Gondola ride offers one of the most interesting tourist experiences that there is. How a Venetian Gondola is made? Let’s look at the Gondola’s technical characteristics. 280 different pieces are required to build a Venetian gondola. 99% of its parts are made of wood: specifically, we need 8 different varieties of wood for a single boat. Making a Gondola takes months and months of work, about 500 working hours. The only different material present is the iron formed in the shape of an S with six teeth. The S represents the Grand Canal while the six forward-facing teeth indicate the sestieri (districts)of the city; San Marco, San Polo, Santa Croce, Castello, Dorsoduro, Santa Croce. While the metallic tooth turned backwards indicates the island Giudecca. The symbolism does not end here. On the Iron is also engraved an arched shape that depicts the Rialto Bridge with the adjacent basin of San Marco, and there are three symbols between one tooth and another, which in the newly built gondolas indicate the three islands of Murano, Burano and Torcello. The color of choice for gondolas was black, not only because it was an expression of elegance and refinement, but also because it was the result of the pitch used to waterproof the hull. Today, of course, technology has progressed but the gondolas, which once had ornaments and canopies to transport the rich passengers in privacy, are more essential. This is to ensure easy movement and the best possible view for the gondolier so as to avoid collisions in the narrow waterways of the city. Count on the trips organized by Dragonfly Tours to live your gondola experience among the less known canals of Venice. The typical “shipyards” where the gondolas are built are called “squeri” in the Venetian dialect, and each squero has a part that faces the water to facilitate the grounding of the gondola. You do not become a gondola builder from one day to the next: you become a Master after months and months of practical experience and after taking an actual exam. Near the countless bridges, you will find gondolas ready to accompany visitors on a unique journey. 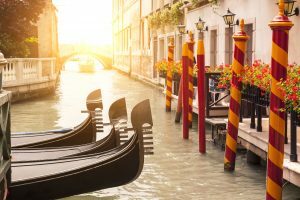 A ride on a gondola is an experience not to be missed: on the 12-day tour in Italy with Dragonfly we have included a gondola ride accompanied by Cicchetti and prosecco. 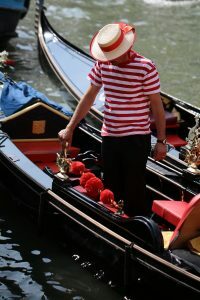 A gondolier will brighten up your trip to Venice telling you stories and anecdotes about the city whether you choose an outing during the day, or a romantic night-time ride. The gondoliers, the drivers of the gondolas, are expert authorities of their art, learned after years and years of practice and often handed down from father to son. In the past they were the guardians of many secrets: every gondolier was at the service of a noble family at every hour of the day and night, and they knew everything that happened in those canals that at night were dark and gave stolen moments of freedom to lovers and gamblers. Today gondoliers have a genuine association that protects one of the most fascinating jobs in the world.